Time to take up the cudgels on behalf of F1's current favorite whipping boy, I think. It seems that everyone includes Kazuki Nakajima in their list of drivers most likely to disappear before or at the end of the year and I am once more puzzled at how the sport deals so differently with drivers in similar positions. Vettel is forgiven every mistake, Nakajima castigated even when he does well. For pete's sake, the poor guy has had only four races so far and been in the points in Melbourne! Meanwhile Vettel has shown some promise in qualifying, only to fizzle in the races. Okay, most of that is down to lack of reliability of his car, but I give him as much leeway as STR did for Speed last year on that score. The fact remains that Nakajima has 3 points on the board in 2008, Vettel has none. I know it is asking a lot for F1 commentators to be realistic in their assessment of drivers but, if any are really interested in a balanced viewpoint, they should have a read of Patrick Head's thoughts on Nakajima. It is no surprise that Toyota's influence on the decision for Williams to take on Kazuki as second driver is admitted - we always suspected that anyway. The more important fact is that he would never have been hired had not the team felt he was up to the job. And we all know the truth in that statement - Williams is famous for being very picky when it comes to drivers. So is the team getting value for money? Mr Head seems reasonably satisfied, prepared to concede that the rookie has made mistakes, but also pointing out that Kazuki is learning from them. He is well aware that the potential is there and the experience gained now will pay off later in the season. There is no doubt that Kazuki would have been better prepared for F1 had he been given another season in GP2; but the reality is that he has been pushed forward by Toyota and must sink or swim accordingly. And it seems to me that he is doing exceptionally well in the circumstances. 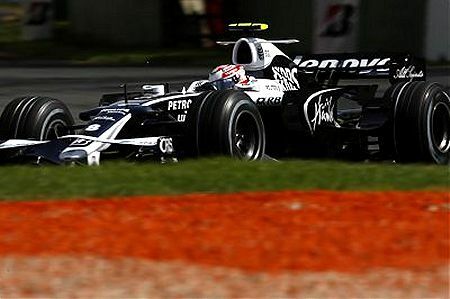 In spite of his rookie mistake of running into Kubica in Melbourne, he still managed to finish sixth. Turning to the Malaysian GP, I can only suggest you watch Nakajima's race on the VisionF1 replay - in the early laps, the guy is stunning, passing Barrichello and Vettel, then coming up behind Piquet and matching or bettering his every lap time. His pit stop strategy was poor, however, leaving him with a very long last stint and a heavy car as a result. In Bahrain, the team gambled on a one-stop strategy for him that turned out to be a bad decision; Kazuki could keep up with the cars around him but could not pass. Those who criticize him at this early stage are clearly not watching carefully and are far too ready to dismiss him as virtually a pay driver, just because of the Toyota connection. I think they are in for some surprises later in the season. And there is one significant aspect that Kazuki has been getting right, in contrast to all previous Japanese F1 drivers: he is finishing the races. Looking at his performances in each GP so far, one can see the old bugbear of Japanese lack of stamina perhaps having an influence - he tends to start well and then tail off as the race passes the midway point. That is something that he can work on, however, and I have no doubt that he will improve with experience and training. But he finishes. He does not throw it off the road and his mistakes have been minor. That has to be a good, solid start for any rookie. Add Nakajima's known speed and the likelihood is that we are watching the development of the best Japanese F1 driver ever. Laugh if you wish, but go watch the VisionF1 replay before you do so. Good points Clive but you got your Nakajimas in a knot in the fourth paragraph. "Williams is famous for being very picky when it comes to drivers." FINANCE has much more to do with Sir Frank's "pickiness". Dropping Pizzonia who scored four 7ths and a dnf, not bad for a rookie, in fact far better than most rookies today, he was dropped in favor of Heidfeld under pressure from BMW. Nagajima was also "picked" under pressure from Toyota. Heidfeld has since done well, so maybe that was a good "pick" but Williams didn't benefit from it. Nagajima? Not enough history to make a call yet and even if he does eventually improve, it will likely be after he moves to home team Toyota. Sir Frank is apparently a talent scout and "picks" them for other teams. Here's a move that will get your readers buzzing.........replace Nagajima with Sato. Replace Vettel with Davidson. That's not gonna happen but it'll make for some 'fun' chat! Thanks, Steven - just goes to show that I should keep my mind on the task in front of me, rather than allow my thoughts to drift on to earlier times! You prove my point, Number 38 - Williams rarely takes on rookies, preferring to steal established drivers from other teams. When finances dictate that they employ a less well known quantity, they remain very hard to persuade and turn down drivers that they know are no good, even when it hurts the team financially. Giving in to Toyota over Nakajima seems to have been a very short battle, probably because they were aware that he has the necessary talent. Sato is an excellent example of the usual run of Japanese drivers - quick but inconsistent and prone to stick the car in the gravel too often. That is why Nakajima's avoidance of off-track excursions thus far could be a pointer for the future. And Davidson has disappointed me in his time with Super Aguri - I had hoped that he would out-perform Sato rather in the way that Button did when they both drove for BAR. No sign of that happening yet, I'm afraid; Davidson and Sato look pretty evenly matched. clipped from Clive above: "I had hoped that he (Davidson) would out-perform Sato rather in the way that Button did when they both drove for BAR. No sign of that happening yet, I'm afraid; Davidson and Sato look pretty evenly matched." Gee wizz, Clive let's consider the CAR!!! But I'll go a step further, let's look at this years finishes, Sato ret, 16th and 17th but Lil Ant has just pipped him with ret, 15th and 16th. When you have a horrible car you can't perform at all !!!! And don't forget when Davidson was test driver for B.A.R. he consistantly topped the charts (and Sato)!!! My defense of Davidson is biased, I always wave the Union Jack but I like both Super Aguri drivers and hope something can be done to save the team. When considering team mates, Number 38, the car is of no import - I presume the drivers have equal equipment. It is not necessary for one driver to finish in the points or on the podium if the car is no good; what matters is that he beats his team mate consistently and by a good margin. That is where Ant has disappointed me - he finishes ahead of Sato occasionally but has not established himself as much the better racer. I must presume, therefore, that they are very closely matched. Has there really been that much Nakajima-knocking? He's a rookie, he's only done foor races, he's looked fairly quick but a bit ragged. Way too soon to write him off though. And his team mate's quite handy - especially in qualifying - so he's not got an easy job. I had quite high hopes of Nakajima coming into the season, and so far I agree that he hasn't disappointed - or hasn't disappointed me at least! Four races in is way too early to be chucking him out, in the same way as it's way too early to be deeming him the best driver ever - as was the case at this point last year with a certain Mr Hamilton. And thanks for linking to the VisionF1 site - it's kinda mesmerising, could watch that for hours! I have never been able to understand why people rate Davidson. He has done nothing remotely outstanding at any stage of his career. In F3 the theory seemed to be that Sato was something really special and Davidson was his team mate and not being blown away so he must be good as well. His early one-off F1 drives were embarassing and since he became a full time driver I have not seen him do anything to justify keepig him in a drive let alone promoting him to a better drive. For my money there are far better drivers around who can't get a break. I seem to stumble upon Nakajima detractors wherever I go, Keith - probably more so in the comments than actual blogs, admittedly. It struck me too that four races is very little basis to be judging anyone so harshly - hence this post. VisionF1 I find to be extremely useful, Craig, especially when I need to check on what exactly happened to one driver during a GP. Add to that the fact that it can be accelerated several times, thereby saving time, and it becomes invaluable. Enjoy! Many would consider that a pretty harsh assessment of Davidson, Steven, but it's also very realistic. On rare occasions he has shone but not sufficiently to indicate that he's anything special.